Back to normal after a couple of NEAR MINTerviews and our Cinematic Universe countdown, the boys settle in to talk comics, conventions and art. Con season is upon us in New England as we sit poised between Boston Comic Con and Granite State Comicon. Ben recaps his experience at Boston Comic Con and his modest foray into original art collection. 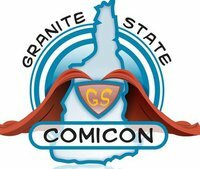 Then, Pat Covey of Double Midnight Comics (and the self-appointed New England Cosplay Ambassador) joins us to talk about Granitecon. We get a full preview of things to come, including Lando, cosplay and a behind-the-curtain look at what goes into putting on a comicbook convention. All this, plus Top o’ the Pile, Can o’ Beans, and some miscellaneous comic talk that includes Josh’s tepid response to Secret Wars and Fantastic Four. It’s our 80th episode and… it exists.